I’ve been meaning to post this picture for some time. Participating in a great Tweetchat last night #Latism reminded me to do it. I have no huge point to make here other than note, as I’ve done before, that irony is the most powerful force in the universe. 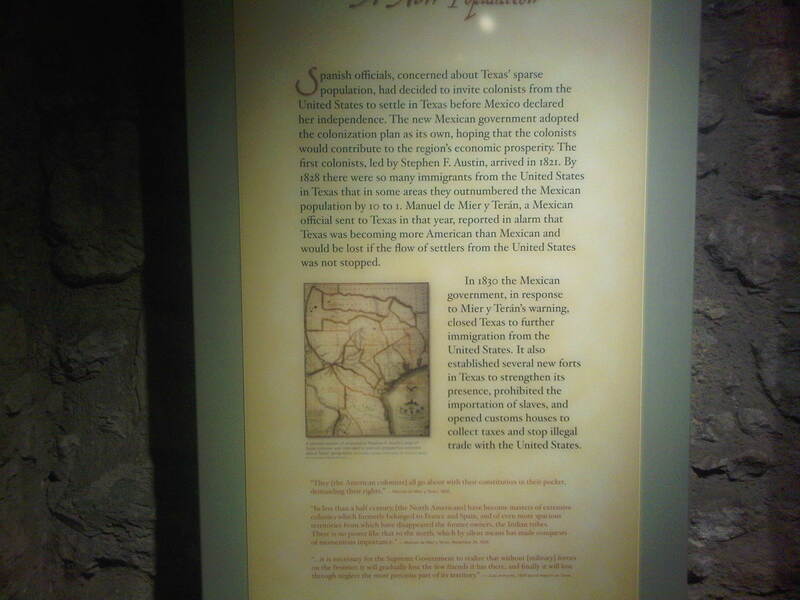 (Also I was reminded by the folks in #Latism last night that, as this text implies, the Mexican Government also had a problem with the settlers owning slaves.) And perhaps this can serve as a small antidote to the self-righteous and smug tone of many (not all) in the immigration debate. As a Latina, specifically Puerto Rican, I’ve watched the events in Arizona with considerable personal interest. (Because I spent my middle and high school years in El Paso, Texas, I also feel I have some understanding of the border culture in the southwest.) I usually visit Arizona at least once a year, I have friends who live there, but it disturbs me now to think that the color of my skin, definitely brown, might make me feel less at ease the next time I go there. Assuming there is a next time. There’s nothing inappropriate with the debate about how best to deal with the immigration issue. But something seems to have happened in Arizona to turn the debate into something bigger, different, and rather ugly. Many in Arizona seem to question the legitimacy and/or desirability of the Latino role in their state. 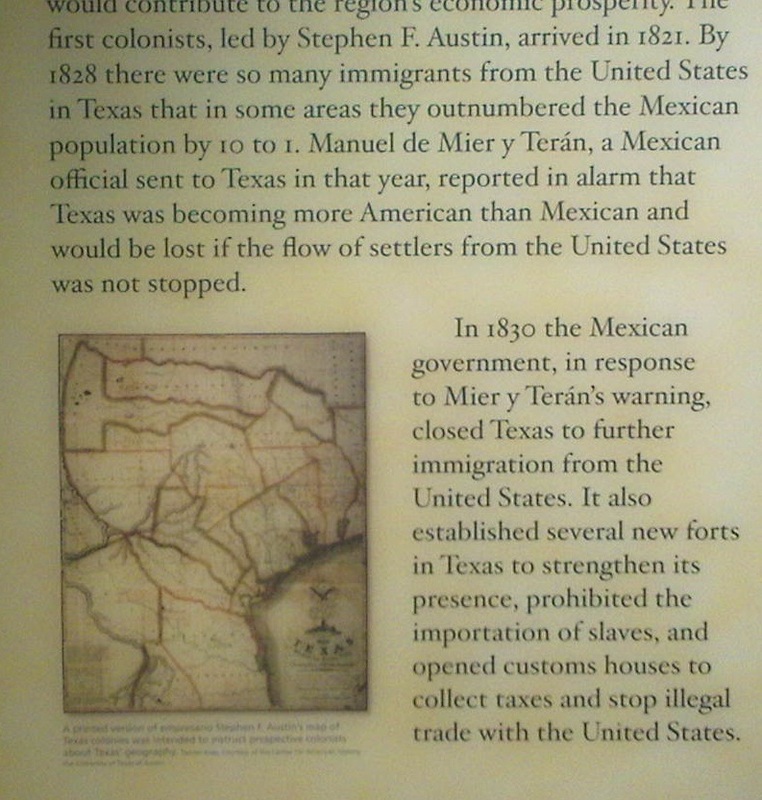 The Latinos don’t belong here, they seem to be arguing, or we need to cap their influence. The Hispanic culture is antithetical to the American spirit. The hardy breed of livestock known as the Texas longhorn descended from Spanish Andalusian cattle brought over by early 16th-century explorers, missionaries, and ranchers…In the early 1800s, Spain lost control of the region and abandoned the area, but ranchero and vaquero traditions lingered, affecting the look, equipment and vernacular of America’s cowboys. Terms like lasso, remuda, lariat, mustang, chaps, and bandana became a part of everyday speech, and America’s cowboys adopted the Spanish traditions of open-range ranching, branding, and round-ups. Who knew? The article in Wikipedia on Cowboy goes into even more detail, noting that open-range ranching began in the medieval era in Spain. (It even discusses the Arabic and possibly Persian influences on the vaquero tradition.) The American word buckaroo is thought to be a corruption of the Spanish word vaquero. What are we to make of the essentially Spanish origins of the great American Western tradition? Should we make all Arizonans turn in their cowboy hats, spurs, and chaps? Or maybe Arizona can borrow the Texas Board of Education to rewrite the history of the American West? The truth, uncomfortable for some, is that Spanish culture has always been a primary influence on the United States. I would have more respect for the proponents of anti-immigration measures if they could somehow make their legal arguments without casting cultural aspersions. I have no problem with enforcing the law. But I do have a problem with imposing a monocultural and false version of America.